Graphic courtesy of Silver Dollar Circuit. We’re only a few days away from the best horse show of the year- February 23-28, 2018. The 2018 Las Vegas Silver Dollar Circuit has once again topped the year prior in stall reservations with another year of increases. This show never disappoints with so many selling points. Not only is there convenience with having the barn, arena, hotel, casino, restaurants, and entertainment under one roof, but there’s tons of fun to be had in Sin City. The city that never sleeps has lots to offer in the way of nightlife, but not much will be able to top the action at the Cinch Bar on Monday night, February 26th in the South Point Equestrian Center. 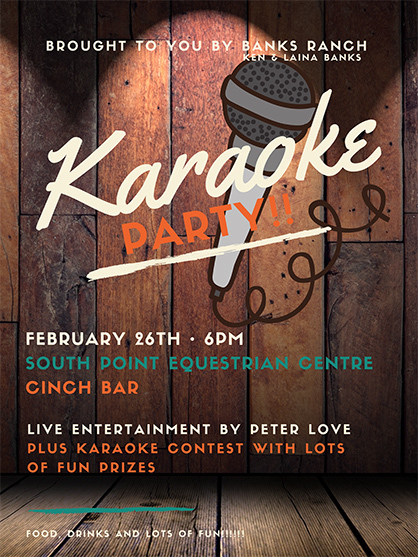 The Silver Dollar Circuit, along with Laina and Ken Banks, are hosting a Karaoke Exhibitor Party. Live entertainment from Peter Love will start the party off and then attendees and exhibitors are welcome to take the stage and show off their talent, or lack thereof. Prizes will be awarded for the worst, the best, and anything fun in between. Another night that’s a must for Silver Dollar exhibitors is the annual Saturday night at the Spazmatics. Although it’s not slated as part of the Silver Dollar show schedule, regulars of the show claim they never miss this show while at the South Point. The super geeks from the Spazmatics play all of the 80s greats. This night will lead to singing, dancing, and overall bonding with competitors. All of the fun, prizes, and extra events wouldn’t be possible without Silver Dollars fantastic lineup of sponsors. This year, the show has added some great top level sponsorships from Kathy’s Show Tack, Trendsetter Performance Horses, and Oak Spring Ranch, who are to join SmartPak, Kimes Ranch Jeans, Markel Insurance, The Equine Chronicle, and Circle S Ranch as the show’s major sponsors. For those attending the show, we expect to see your singing skills on stage Monday night and your 80s moves on Saturday. For those missing out on this year’s entertainment portion, the horse show will be streaming live from SilverDollarCircuit.com where you can also find results, show schedules, and updates. 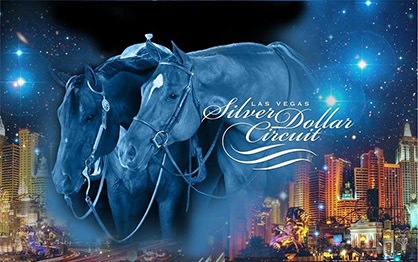 The Silver Dollar Circuit is the largest all-around circuit in the nation (providing no cattle, speed or reining events). It’s touted for its strong focus on exhibitors and sponsors. Running for 42 years, this show pulls exhibitors from all over the nation to compete at the exceptional South Point facility. For more information about the show please visit www.silverdollarcircuit.com.